Organizing Notes: How Many Military Bases Does the Pentagon Really Need? How Many Military Bases Does the Pentagon Really Need? Those who come to my Feb 7 talk in Brunswick will be treated to my very first ever PowerPoint presentation. There are so many photos I'd like to share that I had to finally break down and learn to do PowerPoint. 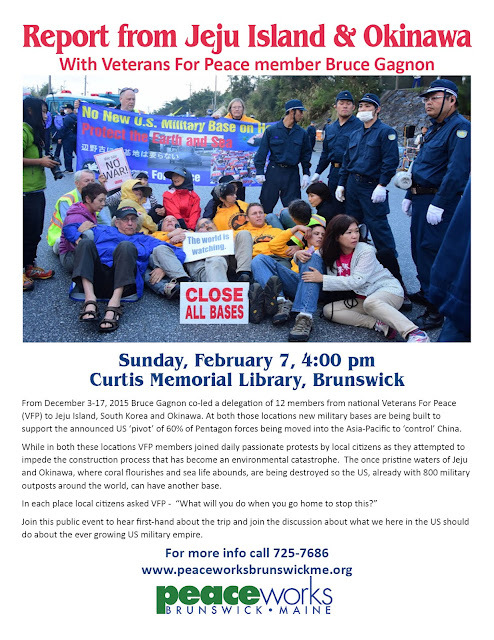 In addition to the event above I'll be joining fellow VFP delegation members from Maine Russell Wray (Hancock) and Dud Hendrick (Deer Isle) for a similar talk on Thursday, Feb 4, 7:00 pm at Emlen Hall, Bay School in Blue Hill. The public is also invited to attend that event.